For some, it’s democratic process that matters. The outcome … maybe not so much. So, let me get this straight: You reckon a billion Chinese are idiots. And you figure China’s biggest problem is that these billion people don’t get to directly choose their nation’s leader. PS It’s of course reasonable and right to be suspicious of such data, in general. 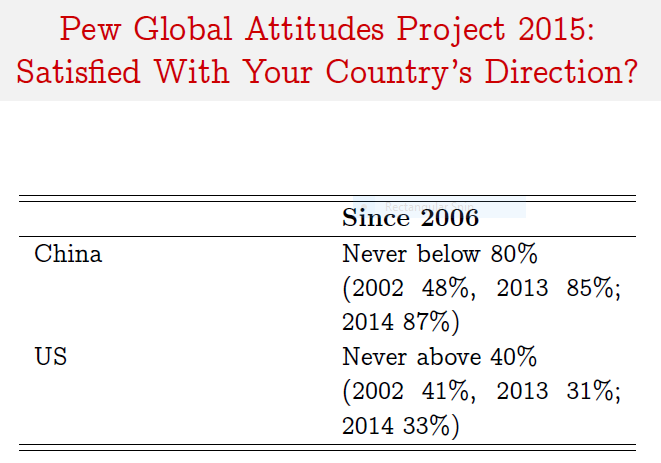 But on the specific point regarding pressure to support the government, the China approval rating in these Pew surveys did go as low as 48% in 2002. So it’s not impossible for the survey to produce considerable variation. PPS I might have been generous when I said “For some, it’s democratic process that matters”.